Sydney architect Domenic Alvaro’s strikingly small, five storey Surry Hills house has had its price expectations adjusted down a bit ahead of its October 18 auction. There is now $1.8 million plus guidance having been initially listed with $1,875,000 plus hopes. The one bedroom trophy home –known as Small House – has been credited for its exceptional urban architectural and interiors features. It has been listed by BresicWhitney agents Ivan Bresic and Shannon Whitney by Domenic and wife Sue after the birth of baby, Alessia. It is important for estate agents with special listings to gauge the market place and make price adjustments, up or down as appropriate. No step pricing here. The recent adjustment one isn’t huge but ought to provide a more solid footing on which to secure wider interest in the auction countdown. 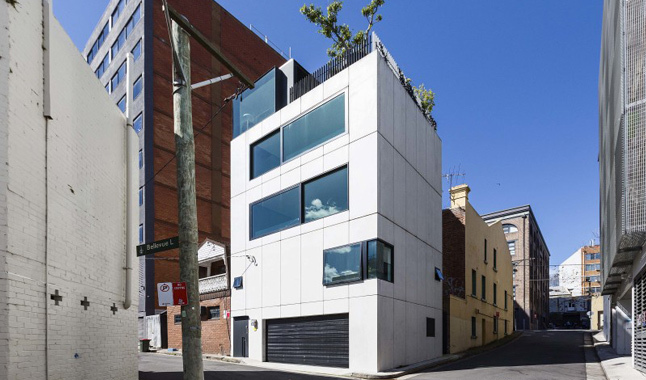 The Grand Designs Australia television host Peter Maddison dubbed 8 Belmore Lane the “house of millimetres” having been conceived after buying what were three car spaces on a corner in Surry Hills and building a five-storey house above it. It comes with an internal floor space of 177 square metres on its tiny 42-square-metre plot. So not for everyone. The block cost $230,000 in 2008, and despite the tiny size of the parcel of land, the house has two bathrooms, living, kitchen and dining areas. Plus rooftop. Not sure how many stairs up from the front door, but gather it is over 60 steps. I must find out at an upcoming open for inspection. I recall when the now award-winning property was featured in the first series of Grand Designs Australia after its 2010 completion by the builder Nicholas Bettar, from Baseline Constructions. Wedged between an old terrace and an industrial building, the slimline house was built upwards rather than outwards, given the site was so small it can fit onto the double garage of a typical Sydney suburban home. Like many traditional homes, the kitchen is the social hub of the house, central to the other living zones. But the vertical nature limits buyer possibilities to a very agile demographic age group. This seems to be a rising trend of gorgeous, yet rather small, properties being sold for unexpectedly high prices. The terrace at 39 Augustus Street, Enmore, listed by McGrath Estate Agents, recently sold for $1.14 million. This house, quietly positioned on a deep block with a rear north east aspect and dual street access and with the many amenities of King Street and Enmore Road just a short stroll away, has two bedrooms and is situated on a 150 m2 plot of land. Many neighbours came out to support the sale of this Inner West property as there hasn’t been a sale on the street for a very long time due to the small size of the properties around it.